» Art & Decor - NEW!!! Thanks for Shopping SticksandBones.com Online Store! Exclusive Products available only here. Note: Please check out our many Product Lines! New Products added weekly. Art & Decor - NEW!!! Sample some of our latest Artworks as Accents for your Home! SANTA CLAUS, The Easter Bunny, The Tooth Fairy. Check out all the Stickman in Peril Action! All the Stickman T-Shirts are here! Also International and industrial symbols and danger signs. Featuring Japanese and European Crests, Great Gift Ideas here with Heraldic Shields, Lions and other authentic Medieval Designs. 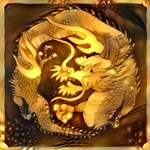 Family Crests and Mythical Beasts from around the world! Designs from the Ancient world! Sticks and Bones.com Exclusive Clothing for Girls and Women! Featuring Our Signature Golden Designs! check out our many designs!